Growing up I always remember my mum sewing, and even now, she still sits at her machine to mend this or make that. I was never blessed with the skill to sew, and I am sorry to say, nor the inclination. However, when I recently visited the site Quilt Fabric Delights, I was filled with inspiration. So many beautiful fabrics and so many possibilities. Quilt Fabric Delights is an online store owned and operated by Sarah Leak in South Australia. I made my way into Sarah’s blog, only to discover this fantastic backpack that she had made. This backpack, along with the other stunning creations you will find on Quilt Fabric Delights Blog simply leaves me in awe of the talent some people possess. At Quilt Fabric Delights you will find a range of designer fabrics, patterns, craft ideas and more. How true this is…Dare to dream, commit yourself to achieving your goal, focus your energies and reap the rewards! Being a work at home mum (WAHM) is a growing trend. Women are leaving the office and opting to stay at home, working around their kids and at a time that they choose. Thankfully, there are some fantastic resources available to help these women succeed. One such resource is Aussie WAHM where you can find a wealth of information, tools and tips for running a business from home. Another is Blog Whammy, which is an initiative set up by Kylie - the owner of Aussie WAHM. Blog Whammy is designed to gain increased traffic to each of the participating blogs. With approximately 10 members participating, the chosen blog for each week experiences a boost in traffic, comments, links and popularity. Blog Whammy is open to any Australian Work At Home Mum with a blog and a website. If you are interested in learning more, go to Blog Whammy and check it out. The pendants in our online store are plated with either Rhodium or Ion Plated Gold. But did you know you can have a photo engraved on precious metals such as 9ct Gold or Sterling Silver as well? Sterling Silver pendants are available pre-made in 3 shapes…a heart, an oval or an ID tag (rounded edge rectangle). All 9ct Gold pendants are made to order. So, you can choose the shape, thickness and size then a jeweller will hand-make the jewellery as ordered. For further details, and pricing please contact us. What can I have engraved on a pendant? So many people tell me that they have never heard of Photo Engraving before. 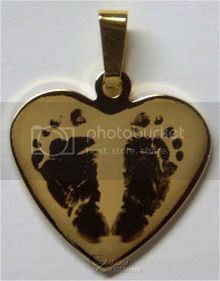 Simply put, the process uses the latest technology to take your photo/picture and engrave it on to a small metal pendant. Resulting in a unique piece of jewellery, perfect as a personalised gift, keepsake or just for yourself. Two questions I get asked regularly at Etched In Memories are: 1) What sort of photo is needed for engraving; and/or 2) What can I get engraved? Our engraving machine is attached to a computer, so almost all photo’s and images can be engraved. The end result, will be dependant on the quality of the picture provided. I have found that clear, sharp pictures with good lighting and minimal shadowing provide the best results. The finished image on the pendant appears clear, crisp and strong. Photo’s can be sent in by post or via email. When emailing photo’s I encourage customers to send through the original digital file (without adjustments, cropping or resizing). When scanning images, try to do so at a high dpi (dot per inch), we use a minimum of 600dpi for pictures sent in hard copy. Once photo’s are received, we generally remove the background, adjust the lighting to suit the engraving and crop the image to fit the size of the pendant. Pictures that are out of focus or lacking detail (due to poor lighting, contrast, under exposure, or low dpi) may still provide a satisfactory result but are best avoided. If customers are in doubt or want to check if their picture is suitable prior to purchase, I am more than happy to look at the picture first. People (babies, kids, couples, best friends, partners, weddings, sports, memorials), Pets and animals (pictures, name tags, memorials), Foot or Hand prints, Zodiac signs, Logo’s, Text messages, Artwork, Religious images, Symbols, Cars, Boats, Houses and more. To check if your image is suitable please contact us.